Sorry for the seriously cheesy title. Can I just say that I am really excited to share my little project with you today? 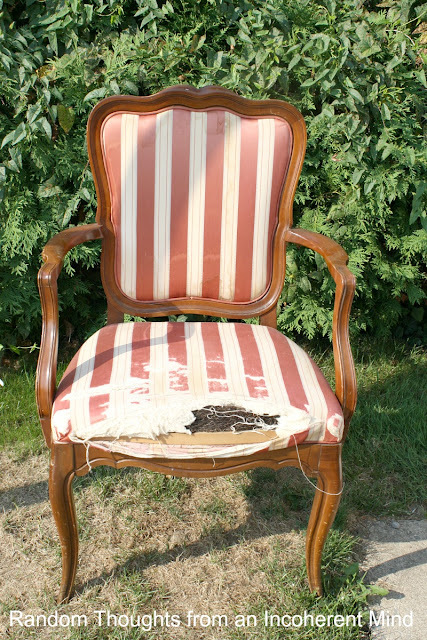 You see, it seems as though everyone in blogland has recovered or reupholstered a chair at one time or another. As much as I have "oohed" and "aahed" at all these beautiful chairs, I never thought I'd be able to actually reupholster one myself. I just don't have that kind of skill. My mom has had this old chair hanging around in her attic for who knows how long. Her plan was to reupholster it, but she never did. So, I stole it rescued it from her attic. I figured I couldn't possibly destroy it any more than it already has been. It took me some time to decide what color I wanted to paint it. It also took me some time to find a fabric that I liked. We only have Joanns and Hobby Lobby around here, so my fabric options were limited. Also, I had no clue where I would put the chair should it actually turn out okay, so I thought it was best to go with a neutral palette. I painted it Annie Sloan's Old White and decided on a Waverly fabric at Joanns. I found the perfect location for the chair in my dining room. I'm sure I will also like it in my bedroom once I change to my fall bedding. oh y gosh...you are truly amazing. I would have never dreamed that chair could look so good!! wow!! Wow Gina, you really did an outstanding job on the chair!!! I bet your mom totally wants to steal it back now! AWESOME job Gina!! I love it and love the fabric you chose for it! You better lock it up when your mom comes for a visit lol! I am a script fabric fan! And I also love creamy white paint. It certainly looks professionly done, Gina. That is a really fantastic makeover. I totally love that fabric! You should be so proud of yourself because that chair is absolutely gorgeous! Love your choice of fabric. Great job. Loving that fabric. Yes, you had better watch your mom......i bet she wants it back. Sheesh... I should have saves those two chairs...*hee,*hee. Maybe you'd better go see what other 'treasures' are hiding in your mom's attic. You might have to do a raid. Just beautiful! I have a similar chair I just started. Hope mine comes out as good as yours. Say whattttt? Awesome job Gina. I have never done it, so don't add me to the everyone list. You did an amazing job! Well in my eyes your are now a re- upholstery pro! Your mom didn't ask for it back did she? Absolutely gorgeous! I've never done any upholstering either so I am really proud of you. The entire chair looks like something off a showroom floor ~ great job! Wow, Gina! This is gorgeous!! Of course, I'm partial to that fabric...it's the same as my kitchen window treatments! You really did an amazing job! You did a fantastic job, Gina! The chair is beautiful and you really put your heart into it! 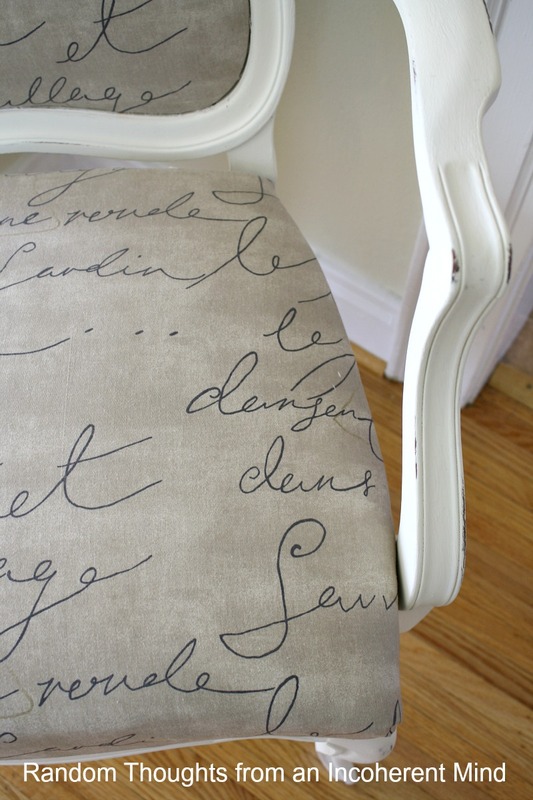 I love the fabric...do you have plans to tackle anything else like this? Gina, this is just so beautiful!!! What a transformation!You have inspired me to continue on working on a chair I am also reupholstering for the first time. If I do half as good as you I'll be thrilled. Keep doing this Gina, you could have a bright future in saving furniture!!! Thanks for bringing this beauty to TUTORIAL TIPS AND TIDBITS!!! Love it, what a gorgeous transformation!! Seriously???? That is awesome!!! You did a fab job, good for you on tackling a new craft!!! Wow Gina, that looks amazing. You did a fantastic job. If I were you're mom you would be missing a chair real fast LOL. Wowzers! That is quite a makeover! You did great! I am your newest follower. I wanted to thank you for stopping by Posed Perfection today and leaving me a sweet note about the Flower Pot Thimble Necklace. I hope you'll visit again and maybe even follow me back. Have a great week! Beautiful result. I'm very impressed with your courage and skill in this project. Oh my I was stunned to when I saw it! You really did a remarkable job on it! The paint color and fabric choice turned out awesome and I love the accent pillow you put on it! Awesome job!! Wowsers! Such a pretty chair! Of course you could do it and it's PERFECT!!! Oh Gina, you seriously did a great job,You should be so proud of yourself...Take that hubby and Mommy!! H Gina! Oh, my, how beautiful! I love what you did with your new/olden chair! It's hard to believe by looking at your chair that this was your first time to cover a chair! Just Beautiful. You did such a professional job on the chair refinishing! The fabric is a great choice. Visiting from Share Your Cup. Fantastic job on the chair. You just gave me an idea for a chair I have that needs to be redone. Your new follower. found you through Fox Hollow Cottage. Wow!! Amazing makeover! LOVE it! I just pinned it via the Pinterest Pinning Party with Fox hollow! You did one beautiful job on this makeover...love that fabric!!! Your chair looks absolutely amazing, Gina! I just love it and love the fabric! You did a wonderful job! You did an amazing job on this chair. It's so classy. I just love it! Thanks for stopping by Posed Perfection and leaving me some comment love. Thanks for the follow too. Have a great weekend. Gina, how gorgeous! It looks like it was professionally done! It is beautiful! I love the fabric! You really did an awesome job! You have been pinned from debbies party. Looks great. Just pinned your chair! Would love to see it at Potpourri Friday! Gina, I saw your chair re-do on 2805 Potpourri Friday. You did an AWESOME job! I have an old chair that belonged to my grandmother and you have inspired me to try upholstering! Thanks again and please stop by and follow me too! 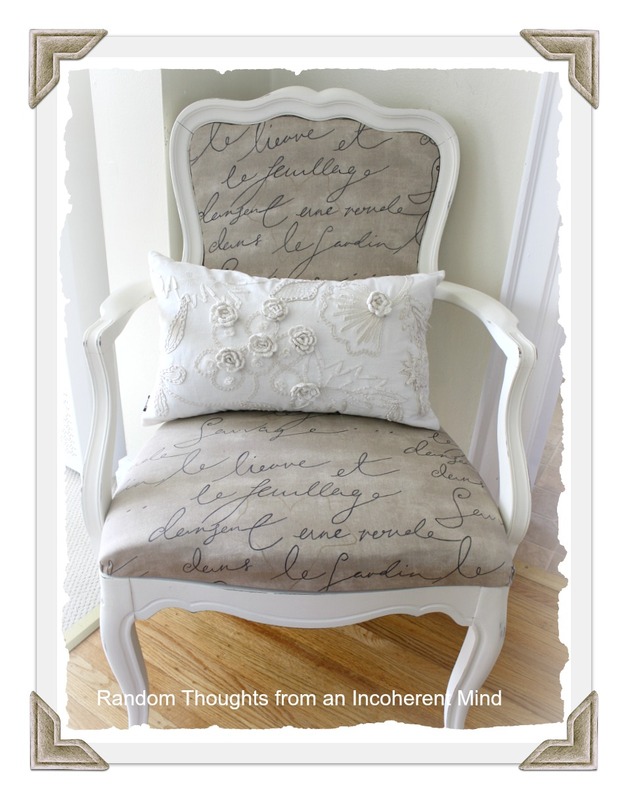 I just featured your chair as one of my favorite pins of the week! 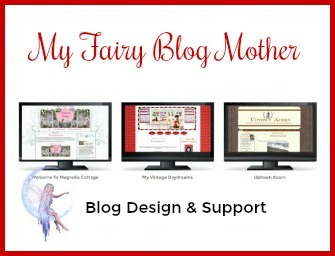 Check out my right side bar!! It's beautiful! You are loaded with talent my friend! OMGosh, Gina!! The chair is FAB!!!!! What a great job you did. You should be sooooo proud of it. OMGoodness, Gina! You really do have skills! I love this chair. This look is so popular in New Orleans right now.....the neutrals and the script fabric. Love this! Oh my Gina, it is absolutely gorgeous! Love the white and love, love the fabric. You did a fantastic job. Not sure I could do somthing like that. Yes, hide that from mama for sure. lol! Thanks for sharing with SYC. Oh, boy! Now I'm the last person in blogland who has never recovered anything!!! I'm hanging my head in shame! You did a wonderful job! And I love the fabric you chose. Well done! BEAUTIFUL! I love the new fabric! Oh my goodness, this is just the inspiration I needed! I have a chair waiting to be re done and this is just what I needed to get me going on it and you know what, it looks much the same as the one I have! 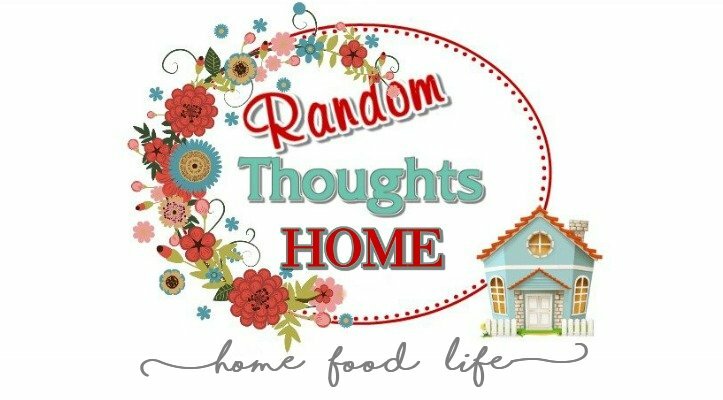 Thank you for stopping by to see the kitchen! You summed it very well, with all the blogs out there to see I think you for coming by mine! I will be featuring your chair at SYC today. Love it too much not to. WOW! It turned out absolutely gorgeous, Gina! I love EVERYTHING about it - the shape of the chair, the color you painted it, the fabric you chose, AND the accent pillow. Did you make the pillow, as well? It's fabulous! 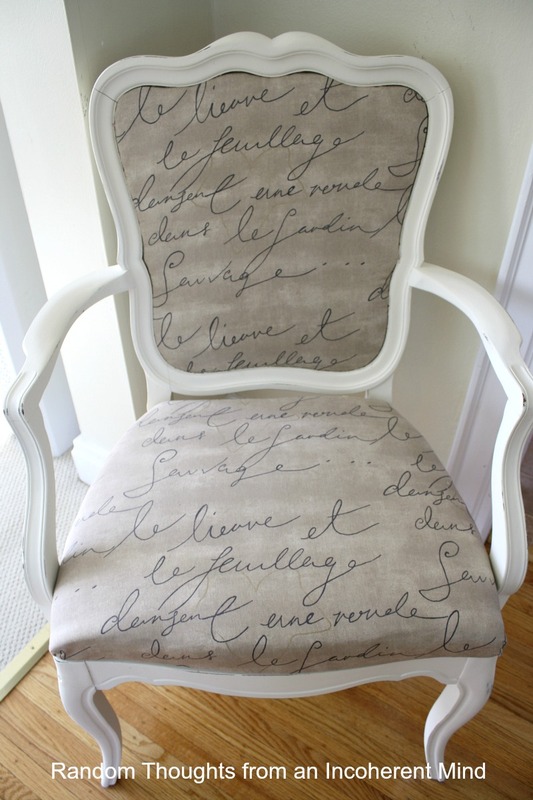 What a beautiful chair makeover, Gina--I love the fabric that you chose! Gina! you did a fantastic job on this beautiful chair! You did a great job! I have a chair I want you to meet, lol! The shower looks great too, and the fireplace! You have been a busy gal! Very creative! You did fabulous on this! Featured you today! Your chair is just fantastic. Love the fabric! Great job! Gina, I love everything about this chair...you did an amazing job! Great job! I have a similar chair and for a year have been to scared to redo it. You are giving me hope. Any suggestions..tips?